These tips have been researched and honed over many years to ensure no sauce slippage. Once you master them, you'll never lose a drop of chili again. The chili dog is one of the highest forms of the hot dog, mixing the deliciousness of the wiener with the spiciness of the chili, and yet it is also one of the most hazardous to shirts, dresses and other items of clothing, as one false move can cause a fashion faux pas. With February 25th’s National Chili Day fast approaching, in an effort to save Americans the humiliation and dry cleaning costs of chili stained outfits, the National Hot Dog and Sausage Council (NHDSC) has teamed with Washington D.C.’s legendary restaurant Ben’s Chili Bowl and its resident historian, George Washington University’s Bernard Demczuk. Ph.D., on a new video detailing the proper way to eat a chili dog to avoid sauce slippage. The video features Dr. Demczuk and NHDSC ‘Queen of Wien’ Janet Riley and shows the strategy from start to delicious finish. The tips are adapted from Dr. Demczuk’s “Bernie’s Dog Bite Method” brochure, and outline five steps to conquer the chili dog. The steps include the proper positioning of the dog, the ideal grip, the strategy for lifting the hot dog, the ideal angle for entering it into your mouth and, of course, the correct way to bite the dog. 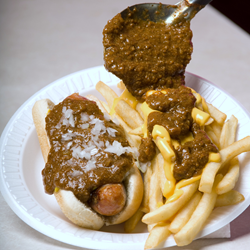 The video was shot at Washington, D.C.’s original Ben’s Chili Bowl location where President Obama and numerous other elected officials, celebrities, athletes and others have enjoyed chili dogs and half smokes. It is the latest of the NHDSC’s videos on hot dogs including the official hot dog etiquette guide and ‘how hot dogs are made.’ All of the NHDSC’s videos and other resources on hot dog facts, history and culture are available at http://www.hot-dog.org. The NHDSC is also on Facebook at http://www.facebook.com/NHDSC.